All About our Bobtails ! Our ?Love Affair? 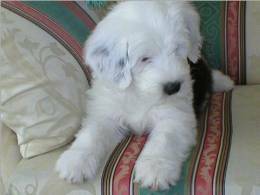 with the Old English Sheepdog began over 30 years ago, in the early 1980s when we bought our first beautiful girl by Dervance Desmond. From then on we were 100% hooked and completely besotted by the breed. We live on a small farm nestled on the South/East Yorkshire borders where our dogs are allowed the freedom to enjoy and express themselves. They mix happily with our Appaloosa horses and our cats (who definitely rule the roost) Our dogs are rarely on leads but being the dogs that they are, are 100% absolutely dedicated to us and know every inch of our farm, probably better than we do. When we are mucking out stables (daily) the dogs are right there with us, and for every human journey to the muck pile, our dogs manage at least two! and are brilliant at second guessing our every move. Without exception our dogs are glad to be alive and love the freedom we allow them... and they most certainly bloom! We wouldn?t ever boast that our dogs are the best groomed show dogs in the world but they must be amongst the happiest and most content with their lot. We currently live with our 7th generation of Haverlands dogs. They are all gentle souls who adore people and other animals. If you are interested in a bobtail puppy then please do let us know. We may be able to steer you in the right direction of a good litter or we are just happy to chat to like minded people !